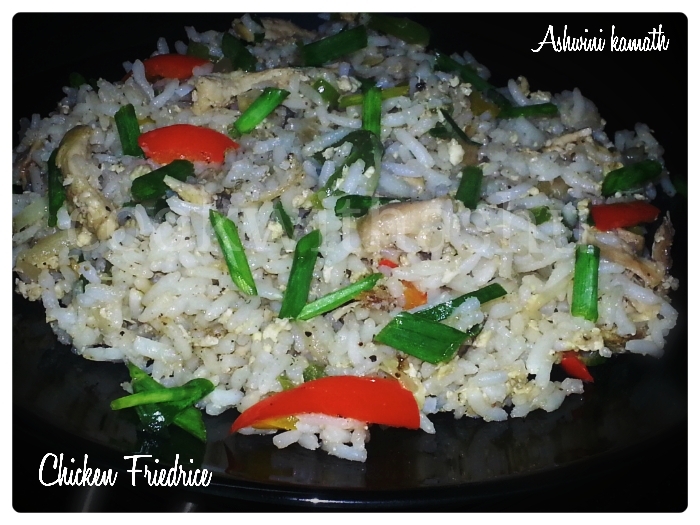 This is chinese preparation prepared with rice and chicken….almost all chinese recipes are same one or other ingredients may vary thats all….very easy to prepare…. ▪ first wash rice and soak it for 15min. ▪ boil water add salt and few drops of oil, add rice cook 3/4 (see that rice is not over cooked) and drain the excess water , spread the rice on a wide plate to cool this makes rice perfect..
▪ add in beated eggs fry this well..
▪spring onions fry till mixed…..
*here I have used 1/2cup basmati and 1/2cup sonamasoori for preparing rice….